TORONTO, Jan. 29, 2014 /CNW/ - Even before the winter ice storms and arctic air masses hit Canada, 11-year-old Arvin Bal from Oakville, Ontario was writing about the importance of a place to be safe and warm. Arvin's essay (excerpt below) was chosen from over 7,000 entries across Canada, as the winner of Genworth Canada's 7th annual Meaning of Home Writing Contest. Genworth Canada's Meaning of Home contest invites Grade 4, 5 and 6 students from across Canada to submit a written essay about what home means to them for a chance to direct $60,000 to a Habitat for Humanity Canada build and receive a pizza party for their entire school. This year's contest raised more than $120,000 for Habitat for Humanity builds across Canada and saw a 40 per cent increase in participation over 2012. "We are so thrilled to see this contest grow year-over-year, as we continue to support Habitat for Humanity," said Brian Hurley , chairman and CEO of Genworth Canada. "Even more inspiring, though, are all the entries we read which show how committed these children are to helping others and how much they appreciate all that they have." "I was so impressed by the entries I read that it was difficult to pick one winner," said television personality Scott McGillivray , another strong supporter of Habitat, who joined the Genworth Canada final judging panel to help pick the winner. "This contest is a great way for kids to help those in need get a better start on life and I was humbled by the thoughtfulness of these Canadian youth. They are all winners." Since its inception in 2007, the Meaning of Home contest has resulted in over $675,000 in total grants from Genworth Canada being directed to more than 30 Canadian Habitat affiliates. As part of the contest, Genworth Canada donates $5 per entry, enabling every participating student to help a deserving family become home owners. "Many Canadian families are forced to live paycheque to paycheque, making it nearly impossible to get ahead. They must decide between things like heat and rent - a decision no family should ever have to make," said Kevin Marshman , President & CEO of Habitat for Humanity Canada. "Through this contest, thousands of Canadian youth have come further to appreciate all that they have while helping many families and their children access safe, decent and affordable shelter of their own." Students were also invited to post videos describing what home means to them for a chance to win additional prizes and Joshua Abbott of East St. Paul, Manitoba was the video winner. The videos are available at www.youtube.com/meaningofhome. 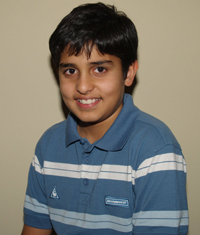 To read Arvin's complete essay and the other winning entries, visit www.meaningofhome.ca. Genworth MI Canada Inc. (TSX: MIC) through its subsidiary, Genworth Financial Mortgage Insurance Company Canada (Genworth Canada), is the largest private residential mortgage insurer in Canada. The Company provides mortgage default insurance to Canadian residential mortgage lenders, making homeownership more accessible to first-time homebuyers. Genworth Canada differentiates itself through customer service excellence, innovative processing technology, and a robust risk management framework. For almost two decades, Genworth Canada has supported the housing market by providing thought leadership and a focus on the safety and soundness of the mortgage finance system. As at December 31, 2013, Genworth Canada, had $5.6 billion total assets and $3.0 billion shareholders' equity. Find out more at www.genworth.ca. Founded in 1985, Habitat for Humanity Canada is a national, non-profit organization working towards a world where everyone has a safe and decent place to live. With the help of over 50,000 volunteers every year and 65 affiliate organizations from coast to coast, their mission is to mobilize volunteers and community partners in building affordable housing and promoting homeownership as a means to break the cycle of poverty in Canada and around the world. For more information, please visit www.habitat.ca.